The National Bank of Ukraine has issued (5th June) the third coin design and subject which is part of their annual and ongoing series of Ukrainian “Flora & Fauna,” begun in 2016. 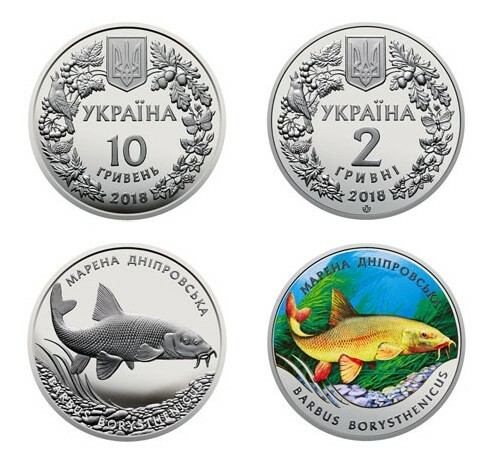 The two coins: A silver Proof and base metal with full colour, feature an indigenous underwater species, the Dnieper barbel. This is a species of freshwater fish belonging to the family Cyprinidae, which includes the family of carp. The Dnieper barbel shares the common name “barbel” with its many relatives in the genus of Barbus, of which it is the type species. Similar names are used elsewhere in Europe, but the name derives from the four whisker-like structures, or “barbs,” which are located at the corners of the fish’s mouth. The overall species of barbus is native throughout Northern and Eastern Europe, ranging north and east from the Pyrénées and the Swiss Alps to Lithuania, especially Ukraine, and into the northern Black Sea basin. The particular subspecies of the Dnieper barbel is so named because it is seen throughout the whole of the Dnieper River. The Dnieper barbel is also prevalent in many parts of the Pivdennyi Buh River, which are located further west into Ukraine. Carp are often the major species of fish consumed and cultivated since they make up the greatest portion of species in most waterways, with the exception of fast-flowing rivers. In Eastern Europe, they are often prepared with traditional methods such as drying and salting, which traditionally preserves the food during the winter season. After the increased availability of inexpensive frozen fish processing, drying and salt preservation became less important than before. As carp also remains popular for food, they are harvested due to recreational fishing where they have been deliberately stocked in ponds and lakes for centuries. However, despite the vastness of its natural habitat, the Dnieper barbel, is now considered a disappearing species and is listed in the Red Book of Ukraine as well as the European Red List as a protected species. The coins are produced by the Ukranian Mint at their facilities in Kiev, on behalf of the National Bank of Ukraine, and are designed by Vladimir Demyanenko. The reverse includes a beautifully detailed depiction of the Dnieper barbel against a stylised river bed in the background. On the two-hryvni denomination, this depiction is displayed in full colour. The semi-circular inscription above the primary design reads МАРЕНА ДНІПРОВСЬКА (Marina Dniprovska) and BARBUS BORYSTHENICUS, which is placed below. The obverse of the coin includes a standard design which is seen on the previous issues from 2016 and 2017 and includes a wreath frame formed from images of certain species of flora and fauna. A small state emblem of Ukraine is positioned between the ends of the wreath and the inscription УКРАЇНА 10 ГРИВЕНЬ is arranged in three lines while the year of issue, 2018, is placed below this text. The 10-hryven commemorative silver Proof coins are encapsulated and presented in a custom case, accompanied by a certificate of authenticity. The cupro-nickel examples are packaged in a coin-card format. For additional information on the issue of collector and commemorative coins from the National Bank of Ukraine, please visit their website. The National Bank does not yet retail coins directly to international destinations.